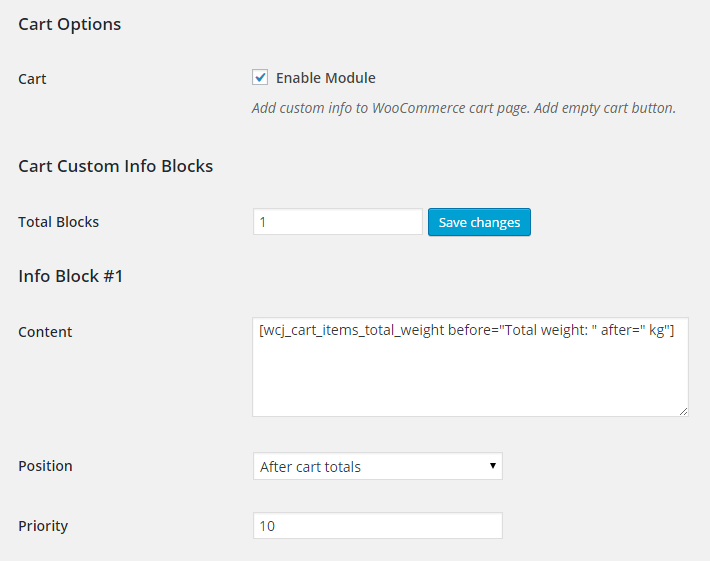 When enabled, WooCommerce Cart Custom Info module lets you add custom info to WooCommerce cart page. This feature allows you to add a final checkpoint for your customers before they proceed to payment. Show custom information at on the cart page using Booster’s various shortcodes and give your customers a seamless cart experience. Show more information at cart! To modify the position inside chosen block, use priority option. For example, show them the total weight of their items, any additional fees or taxes, or a confirmation of the address their products are being sent to. The problem is when its a variable product, doesn´t show the single SKU for each variation, only the main SKU. Hi, How can I not let my customers and guest customers to see the “you save 20%” when they purchase more than a certain amount , example 12, 48 or 240 quantity in the cart, but only letting my subscribers see it? Thanks for any reply. You would need to edit order items table template by adding a custom column “item_product_input_fields_with_titles”. You can read more about it here: https://booster.io/shortcodes/wcj_order_items_table/.